Mister Rogers—not Big Bird—is the face of the public broadcasting Mitt Romney wants to do away with in order to save a few pennies of the federal budget. Let’s face it: If PBS had never existed, Sesame Street would be somewhat viable on commercial TV, because it’s frenetic and energetic and can sell merchandise and such. Big Bird and Grover and “brought to you by the letter M” would be intercut with commercials for the latest marshmallow-laden breakfast monstrosity or Tonka trucks (do they make those anymore?) or Barbie or something. The show would have lost its soul, but it would have survived. But if commercial TV had been the only outlet available 50 years ago, there’s no way Mister Rogers would ever have been on the air—if for no other reason than that I find it hard to believe that Fred Rogers would have tolerated visits to the Land of Make-Believe followed by quick-cuts to loud cartoons selling Count Chocula. There’s a reason Mr. Rogers didn’t take off as a merchandising giant like Sesame Street: Mr. Rogers just doesn’t sell things. It’s not what he does. 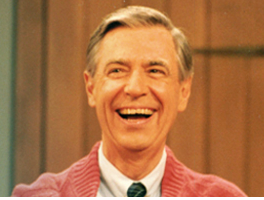 So if there were no PBS, Fred Rogers would probably have lived out his life as a much-loved children’s minister at a local Presbyterian church in the Pittsburgh area… not as a nationally-known figure whose gentle spirit taught millions of children that they are special and valuable just for being who they are. If Mitt Romney had been president in the 1960s, America would never have known Mr. Rogers—and no matter how many pennies we might have saved on our income tax return every year, we as a nation would have been much, much poorer for the loss. It’s not Big Bird that Mitt Romney wants to fire… it’s Mister Rogers. And that says something about both Mitt Romney and his vision for America. In Mitt Romney’s America, anything that isn’t viable in the “marketplace” — like a quiet and affirming show by a gentle Presbyterian minister who teaches children that they are special people deserve to be loved simply for being who they are — doesn’t deserve to exist. That’s not the America I want to live in—and if your childhood was touched by Fred Rogers’s gentle spirit, I don’t think that’s the America you want to live in either.